Company selects scalable document management - BizTech Solutions, Inc.
New Jersey Natural Gas is the principal subsidiary of New Jersey Resources, a Fortune 1000 company, which provides reliable energy and natural gas services including transportation, distribution, and asset management in states from the Gulf Coast to the New England regions, including the Mid-Continent region, the West Coast and Canada. NJR safely and reliably operates and maintains 6,700 miles of natural gas transportation and distribution infrastructure to serve nearly half a million customers. For many years, New Jersey Natural Gas (NJNG) utilized a document management system to maintain information regarding their installations. These ‘gas records’ are accessed by outside contractors who need timely access to diagrams of the geographic sites showing the exact location of gas lines, meters, and other relevant environmental information in order for the contractor to do their work safely. Unfortunately, the old document management system was growing obsolete. It was time-consuming and difficult to support, and not flexible enough to meet the company’s growing business needs. Special software was needed on each contractor’s computer in order to access the application, requiring ongoing maintenance and support from NJNG’s technical staff. The system was not easy for contractors to access and was not always available. NJNG had worked with BizTech Solutions, Inc. previously to solve business automation issues and again looked to BizTech for guidance in replacing the outdated gas records system. The INDICIUM software suite was selected to provide the scalability, flexibility and reliability that NJNG and its contractors required, on a more modern, easier-to-support platform. INDICIUM Capture and INDICIUM DM were implemented to capture and store all of the gas records. Using the INDICIUM Migration Connector utility, approximately one million objects (1.5M images) were extracted from the old system and imported with the associated meta data into the new system. During the conversion process, any objects or data found corrupted in the old system were repaired and restored within INDICIUM. The new system is integrated with the existing Geographic Information System (GIS), enabling authorized users to access gas records stored in INDICIUM directly from the GIS application. The INDICIUM system has a zero-footprint Web Client which allows the company’s outside contractors to easily access the system, without requiring configuration support from NJNG technical staff. 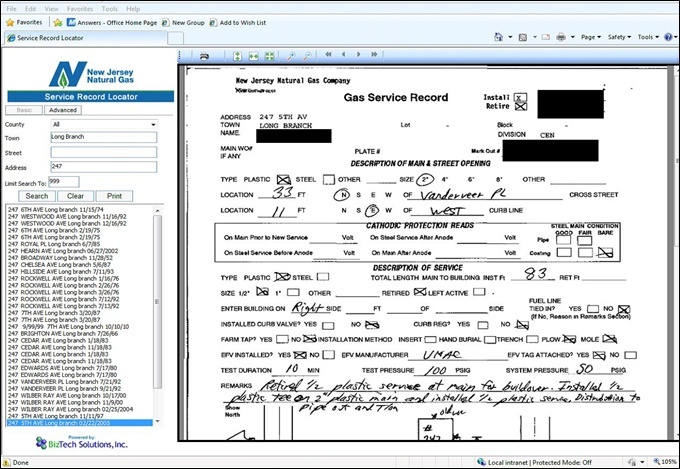 Contractors can easily search for, view, and print the gas records they need. The INDICIUM software provides a targeted document-level search capability that was not possible in the former system where users had to navigate a complex folder structure. System support costs for the new INDICIUM system are lower than with the former system. With the migration to the new enterprise platform, NJNG can quickly expand their usage by adding other document types to the repository and incorporating automated workflow and notifications into their business processes. In less than a week, their accounting department was able to begin using the system to maintain contracts within INDICIUM.